Around 6 months, your baby will be ready for “solid” food. To help you navigate this stage, Bridget Swinney MS, a registered dietitian specializing in family nutrition and author of Baby Bites and Eating Expectantly, weighs in on some of your most burning baby food questions. Swinney discusses what should be on the menu, the politics of food pouches and peanut butter, common baby food myths and more. Q: What foods should parents avoid feeding their baby during the first year? A: Honey is a for sure no-no; so is cow’s milk. Other than that, there’s nothing else babies should avoid, except for the typical things you wouldn’t give to any children, such as undercooked and raw meat and raw eggs. Don’t avoid feeding your baby gluten–containing or allergenic foods. Research shows that introducing these foods in small amounts during the normal time babies start solids (at 6 months) may actually prevent intolerance and allergy. Q: Is it really okay to give a baby peanut butter? A: Yes, according to the LEAP study, introducing nuts to kids at high risk for allergy actually decreased risk for allergy. The AAP’s position on introducing solids doesn’t limit specific foods. Nuts and peanut butter are both choking hazards, so if peanuts are introduced to a baby, it needs to be in powdered or butter form, mixed with another food, like cereal and breastmilk, to make it easier and more acceptable to eat. Update: On January 5, 2017, the National Institute of Allergy and Infectious published its guidelines for peanut allergy prevention in the Journal of Allergy and Clinical Immunology. The guidelines recommend that high-risk children–those with severe eczema, egg allergy, or both–be given peanut-containing food, as early as 4 to 6 months of age (preferably during breast feeding) to reduce the risk of peanut allergy. Be sure to introduce solid foods first, though, so you know that your baby is ready developmentally for peanut-containing foods. The guidelines also recommend introducing peanut to babies with mild-moderate eczema around 6 months of age. If your baby doesn’t have eczema or any food allergy, you can go ahead and introduce peanut-c in to your baby’s diet with other solid foods that are age-appropriate. Here’s more on the new guidelines and preventing peanut allergies from Hugh Sampson, M.D., director of the Eliot and Roslyn Jaffe Food Allergy Institute at Mount Sinai in New York City. Dr. Sampson was involved in creating the guidelines. Q: What about when preparing homemade baby food? Any no-nos there? A: Yes. Don’t add salt or sugar to your homemade baby food. But spices are different. It’s important for babies to begin experiencing the spices that you use in your family early on. After your baby tries all the single ingredient foods, begin adding one spice (or garlic or onion) to a food and wait a few days to make sure there’s no allergic reaction. Spices in general aren’t highly allergenic. And keep in mind, when you’re preparing foods that are naturally high in nitrates, including green beans, carrots, squash, spinach and beets, I recommend using frozen produce rather than fresh because the nitrate content of fresh foods increases with storage time, especially at room temperature. (Editor’s note: Nitrates are chemicals found in water and soil. They can cause methemoglobinemia, a type of blood disease in babies. It’s rare; babies younger than 6 months are the most susceptible to it.) And even then, don’t keep higher-nitrate homemade baby food made from frozen produce or otherwise for more than two days and refrigerate it promptly after serving. If you’re looking for some yummy DIY baby food ideas, check out these recipes for success. Q: How do you feel about food pouches? Any drawbacks to using them besides cost? A: I can see the benefits of food pouches. They’re a convenient way for babies and toddlers to eat fruits and veggies; and eating from a food pouch is considered a responsive feeding method. That is, your baby is in charge of how much and at what speed to eat. I can also see the drawbacks. 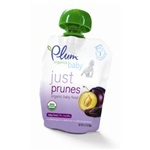 It’s too easy to pass your baby a pouch when maybe he doesn’t need to eat–kind of like a fruity pacifier. Another downside: Eating from a pouch is similar to sipping from a straw. Your baby doesn’t use the muscles and skills needed to eat from a spoon. Learning to eat from a spoon and self feeding is important for many reasons. For one, it helps strengthen the muscles needed for speech. The bottom line? Food pouches should take the place of one-on-one feeding time. But as long as you don’t use food pouches excessively, they can have their place in infant feeding. They’re convenient and easy to eat. They could even help toddlers eat fruits and veggies. But overall, when it comes to food packaging, I’m not a fan of plastic. I recommend buying baby food sold in glass jars. Q: Is it dangerous to feed your baby a combination food pouch (that has two or more fruits and veggies in it) without trying each individual fruit or vegetable first? A: Yes. It’s always best to introduce single ingredient foods first and wait three to four days between to assess for allergy. The other thing to watch out for are ingredients. Sometimes when you get into mixed dinners, what’s in it may not be what you think based on the name. Read labels carefully. And use the combos in the pouches to give you ideas and make the same dinners at home! Q: What about iron-fortified rice cereal? Should parents avoid feeding it to their baby because of the arsenic it may contain? A: Babies have been eating rice cereal for a long time—and the arsenic has probably always been there in the soil. It’s just coming to our attention now. My motto is better safer than sorry. For that reason, I steer parents toward using a naturally iron rich food like pureed beef, lamb or turkey as a first food instead. It’s more nutrient-rich anyway! An iron rich food is important at the beginning because baby’s iron stores dwindle around 6 months. Other great early foods are avocado, sweet potato or squash. You can also introduce gluten containing foods like wheat and barley early on. Q: When should babies switch from whole milk to skim milk? A: It depends on the baby. The AAP recommends lower fat milk for toddlers who are at risk for being overweight. It’s best to consult with the pediatrician for specific advice. Q: What are the most common myths that are still out there about infant feeding? 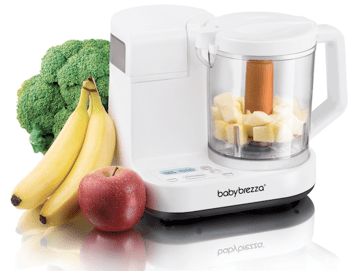 Q: What products can help make feeding a baby easier? Stainless steel bottle. It isn’t necessarily easier, but I like that it’s stainless steel—no plastic. Stick or immersion blender. This is what I used to do many of the recipes in Baby Bites. It’s an easy way to give your baby the foods the rest of your family is eating. Just set some aside before you season it and use the stick blender to puree to the right consistency at the table. Phil & Ted’s Lobster Chair: With so many parents taking their babies along when they eat out, it’s important to have a chair that can go along for the fun. I haven’t used or seen this chair in person, but it’s looks like a good one! Silicone ice cube trays. Look for small ones designed for baby food with a slide on lid. A long sleeved bib. My son was a huge watermelon lover but when he ate it, it was like he took a bath in it! That’s when we invested in a long sleeved bib! It’s great for parents who cringe when they see their babies playing with their food. Playing is important for learning. Just have your baby put on a cover up. 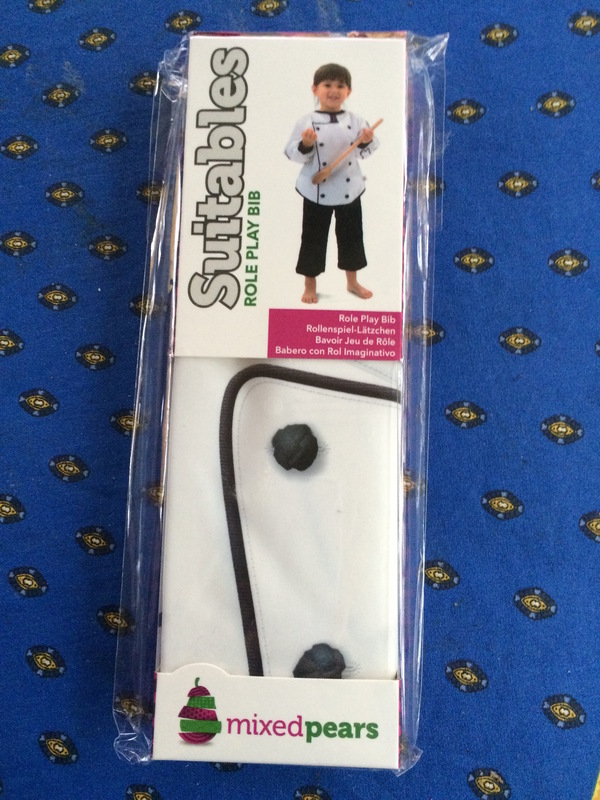 Some long-sleeve bibs multitask: They have a STEM theme, such as this Suitables Role Play bib by Mixed Pears. It’s a doctor’s coat. It’s water and stain repellant, breathable and lightweight and machine washable (hang to dry). A dog. We had two dogs when my kids were little. They were the clean-up crew. Kids make a mess when they start feeding themselves. Dogs make the clean-up easy.